Saint Philothei was born in Athens in 1522 to an illustrious family. Against her will, she was married to a man who proved to be most cruel. When he died three years later, the Saint took up the monastic life and established a convent, in which she became a true mother to her disciples. Many women enslaved and abused by the Moslem Turks also ran to her for refuge. Because of this, the Turkish rulers became enraged and came to her convent, dragged her by force out of the church, and beat her cruelly. After a few days, she reposed, giving thanks to God for all things. This came to pass in the year 1589. She was renowned for her almsgiving, and with Saints Hierotheus and Dionysius the Areopagite is considered a patron of the city of Athens. We all honour Philothei with jubilation of spirit, as this day we rev'rently worship her ven'rable relics. For she lived her whole life working kindness and mercy; and the righteous one, receiving a martyr's ending, is deemed worthy to entreat God that all be granted eternal life with the Saints. 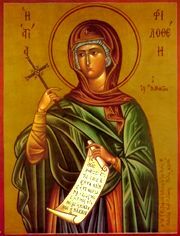 Share the feast of Philothei the Righteous Martyr of Athens with an icon greeting ecard.